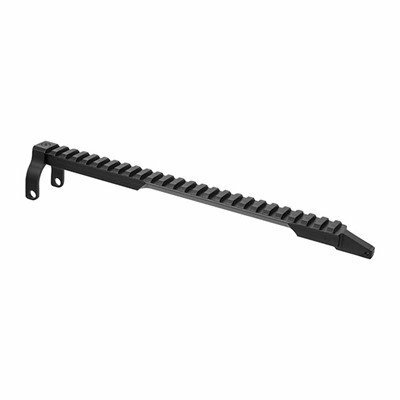 This is a solid aluminum optics rail made for all SKS models that finally gives you an affordable option to mount a scope or other optic onto the SKS without any form of gunsmithing or filing (other than removing the tab on the receiver cover retaining pin - replacement provided) and that keeps it's zero after cleaning - every time! This lightweight Alberta-made SKS optics rail eliminates the potential issue of needing to re-zero a sight after cleaning when using the traditional receiver cover mount. It also eliminates the need to use a gunsmith to tap the receiver to use a Choate-type mount (which also requires some stock removal). The 255mm length of Picatinny rail gives you the much more room than the traditional receiver cover mount to place your optics where you want them. It also incorporates a built-in shell case deflector to allow the use of longer scopes without the brass hitting them.